From the UNC School of Medicine to the College of Arts & Sciences, students and professors are abuzz at the HHIVE — Carolina’s new lab for health and humanities research. The HHIVE Lab brings together students and faculty from UNC's medical campus and the College of Arts & Sciences. Spending so much time at home, the woman becomes enthralled by the nursery’s wallpaper — “a smoldering unclean yellow” that is “dull enough to confuse the eye in following, pronounced enough to constantly irritate and provoke study.” She becomes obsessed with it. So obsessed, in fact, that she imagines there are women creeping around behind the patterns of the wallpaper — and that she is one of them. The HHIVE began in Spring 2015, alongside a new graduate concentration within the English department called Literature, Medicine, and Culture. Both help researchers and students “seek to understand how patients interpret illness, how definitions of disease are shaped through cultural understandings, and how professionals can better reflect on their values and communicative practices,” according to the HHIVE website. Such topics were Thrailkill’s focus long before 2015, though. In the ’90s, while attending graduate school at Johns Hopkins University, she felt a vibrant synergy among people working in the arts and humanities and people working in the sciences. “It was this incredible, unexplored territory,” she says. Formerly a pre-med student, she wanted to observe the ways the humanities and sciences overlapped and intersected. Both parties, she found, asked similar questions about how the world works: How do humans make sense of suffering and debility? In this course, she asked her students to become “thoughtful readers of the practice of medicine,” stressing that “modern medicine is also a culture, a complex web of institutions, an economic behemoth, a faith-based practice, an extraordinary work of human making.” First-person narratives from the patient’s perspective helps open their eyes to the fears, hopes, relationships, stumbling blocks, financial worries, shame, and stigma that come with being ill or disabled. Since then, Thrailkill has been an instrumental force in bringing together students and faculty from UNC’s medical campus and College of Arts & Sciences. 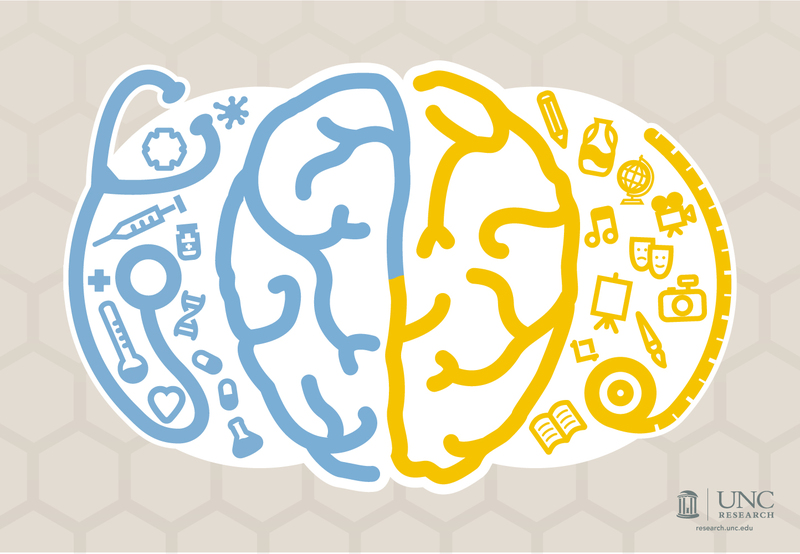 HHIVE and the new graduate program are part of a much larger health humanities effort at UNC that includes an undergraduate Honors minor (called Medicine, Literature, and Culture) and the Medical Humanities Initiative within the Institute for the Arts and Humanities. Faculty partners in social medicine and anthropology catalyzed the M.A. concentration, while the lab is the brainchild of Thrailkill and co-director Jordynn Jack, also an English professor. 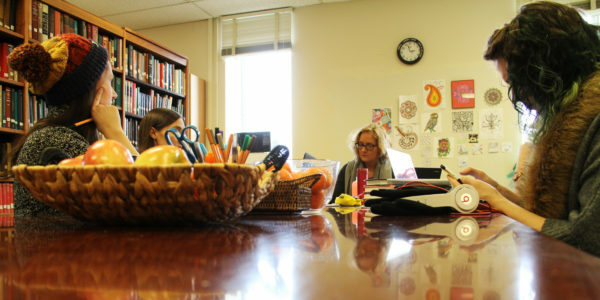 Thrailkill (center) leads a discussion at the HHIVE Lab, located in Gaskin Library on the fifth floor of Greenlaw Hall. Every 11 seconds, an adult over age 65 is treated in the emergency room for a fall, according to the National Council on Aging. Something so incredibly simple often leads to major changes in a person’s quality of life — depression, social isolation, and physical decline are common among fall victims. “When people fall, the first thing everyone does is rush in and ask, ‘What time did it happen? Who was there? Who found her?’” UNC occupational therapist Sue Coppola explains. “It is too rare for someone to turn to the person and say, ‘Why do you think you fell?’ That narrative is extremely important from a health standpoint.” A fall can injure a person’s life narrative, not just their body. Researchers working on a second project within the lab happening during the same timeframe experienced similar results in regard to the importance of patient narratives. The Writing Diabetes Study observed the beneficial effects of writing for patients. It was developed by a mixed group of faculty — literary and rhetoric scholars, an occupational therapist, a medical anthropologist, and an endocrinologist — interested in investigating a shared question: How can crafting stories about their experience help patients with chronic illness? With help from a Fostering Interdisciplinary Research Explorations (FIRE) Grant through the UNC Office of Research Development, researchers created a curriculum for an eight-week writing workshop that would help participants better illustrate their personal story. During that time, they also monitored blood sugar levels to determine if the process of sharing a narrative impacts biological measures. “In both studies, we found that getting there was much more interesting than the destination,” Thrailkill explains. “There were wells of irony, of humor — even dark humor — in the writing.” In the falls study, in particular, the older adults were “utterly delighted” to have young, eager undergrads interview them. “It was really fascinating,” Brewer says. “I expected to hear a lot of feedback in the exit interviews about how cathartic the writing process was and how they made so much sense of their fall experience through writing about it. And while we did get some of that feedback, the thing that really excited people was the inter-generational relationships.” The student researchers were just as enthusiastic as their subjects — so much so the study seemed to “take over their lives,” Coppola shares. Thrailkill and her team bring meaning to the term “hands-on” at the HHIVE. “Our work here is incredibly immersive — and messier as a result,” Thrailkill shares. “We become a part of the research.” They thrive off of the unplanned outcomes, which they believe makes the research more interesting, rich, and real — much like the nature of crafting narratives. Storytelling has always been a way for humans to make sense of the world. It’s a tradition that plays a critical role in cultural preservation and values — so much so that it even predates writing. The earliest stories were shared orally or recorded through elaborate drawings and carvings. And that desire to share knowledge is priceless. Jane Thrailkill is co-director of the HHIVE Lab, director of the M.A. concentration in Literature, Medicine, and Culture, and the Bowman and Gordon Gray Distinguished Term Associate Professor in the Department of English & Comparative Literature within the College of Arts & Sciences. Sue Coppola is a clinical professor in the Division of Occupational Science and Occupational Therapy within the UNC School of Medicine, as well as a liaison for the HHIVE Lab and M.A. in Literature, Medicine, and Culture. Molly Brewer is a graduate student in the Division of Occupational Science and Occupational Therapy, a study coordinator for the HHIVE Lab, and a member of the Literature, Medicine, and Culture Colloquium. Kym Weed is assistant director of the HHIVE Lab and a PHD candidate and teaching fellow in the Department of English and Comparative Literature within the UNC College of Arts & Sciences.